A week or so ago, some car thieves who can't measure straight decided to pull off an overnight theft of a VW Golf from a car-carrying railway car. Their plan fell flat when there wasn't enough hole to move the car through. Do you think they will try again? 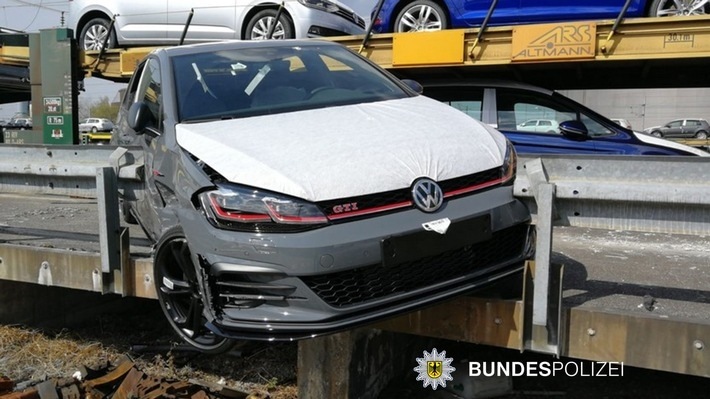 A crew of not-so-enterprising car thieves, who spent time measuring and rechecking and then measuring again as they waited for the right moment to strike, blew it big time last week in Milbertshofen, Germany. The thieves tried to boost a VW Golf at the rail station there, and they found out things don’t often work out as planned. What didn’t work out as planned? Their carefully plotted idea to remove a section of the guardrail along the rail track and so they could roll the Golf off the car-carrier and away into the night. At least, they started to steal the Golf, but things went quickly awry. The plan was to roll a Volkswagen Golf off a car-carrying railway car and into the night. The thieves did lots of work to make this happen. They built a special ramp that was to be used to roll the Golf off the train. And, the industrious crooks had painstakingly measured a section of the guardrail to what they thought was an exact fit. The spot that was chosen also seemed ideal because it was easy to roll the VW off the train and into the night unobserved. If the plan had worked, it was likely the best place for the VW to slip through and off into the countryside. The idea was detailed by CarScoops on Jalopnik last week. According to the Munich Federal Police – as reported on Presseportal – this might have been the perfect car crime with this exception, the thieves didn’t figure on the difference between the real size of the car and the hole they had cut. The Car Is How Wide Now? And, here is the problem that these geniuses didn’t contend with: though they did know the width of the Golf, they didn’t allow for any movement so that once the rail car had passed the point where they could have rolled straight off the carrier, the Golf became much bigger than the available hole. It’s a matter of geometry in that once you change the angle of the vehicle, you also increase the car’s size relative to the available space. So, rather than take time to rethink their plan – they did have most of the night for this – they just continued to bumble onward. Our bright-boy thieves kept on pushing the Golf in the same direction, even as the size differences became more apparent with the angle between the rail-car and the guardrail growing more acute. There is no theft-kit available online or anywhere else that would shrink the vehicle to fit the hole, but, no one told the thieves that. Suffice it to say, the big-brained thieves found themselves and the target vehicle hopelessly stuck at a bizarre angle. So, the gang of car thieves that can’t measure straight abandoned the thoroughly wedged vehicle, leaving it for the police to find the next morning, still idling. And, since they had fled, leaving little or no trace during the overnight hours when this car theft comedy of errors occurred, the police were unable to track them down, even using a helicopter. As of a couple of days ago, the Munich branch of the Federal Police are still flummoxed by this, and they are hoping the public will provide some information about this attempted theft. There aren’t many leads for investigators. Will the thieves do it again? Who knows, but if they do, they’d better make sure of their measurements. Maybe they know this; perhaps they don’t. Indeed, it is still possible that the gang is sitting at a watering hole in the middle of the German countryside scratching their collective head, and wondering why it didn’t work. After all, it works in some of those far-fetched movie thefts, so why wouldn’t it work in real life, they may think? Isn’t it possible for drivers to push sports cars up skyscrapers – they cannot – and to have them leap out of a 64th story to window aiming for another building? Well, no it isn’t! These antics, if they were real, would raise heck with the paint and would likely void the new-car warranty. They should remember that cars aren’t planes; they neither fly nor glide so if you could get a sports car to the 64th floor – highly unlikely – all it would do is drop like a rock. Perhaps the best idea is to forget it and move on to something else. What could that be? How about taking a food truck so at least they would have something to eat.